Personalized books have been around for some time. About twenty years ago, I got one for my wife when we were dating and it was a big hit. You submit their name and some personal information to the publisher and they incorporate that information into their story. As you or your child reads the book, they periodically see their name, their friend's name, their pet's name, their home town or some such and a big smile shows up on their face as the story is about them and not just another impersonal book. Recently, I was given the opportunity to review one such book from the publisher I See Me! They've been doing personalized books since May of 2000. I received the book My Very Own World Adventure. 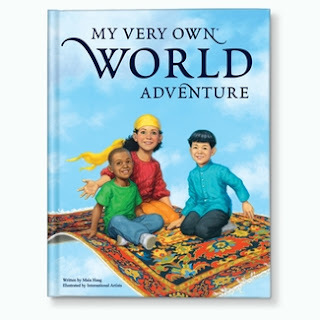 The book takes your child on a world tour through the letters of their name, where each letter takes you to a country whose name starts with that letter. Have a Z in your name? Well, then, you're going to Zimbabwe or Zambia. U goes to Uganda or the United States. K is Kenya or Kuwait. You get the picture, all the way through Zukowski, for instance. What makes this book extra special though isn't just the country connection to the spelling of the names. It is some amazing art work. The pictures are locally sourced where the artist is either from the country or has some direct connection to such. The pictures are of a child from the country where they are presenting a gift to the reader where the gift has some local significance. 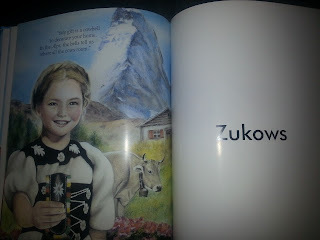 For instance, with S and Switzerland, the child presents a gift of cow bells. There are 63 different artists from around the world who created the artwork. And I have to commend them on such a great job. The back of the book includes small versions of all 63 countries available so you can see all pictures, not just those in the name presented. Their biggest dilemma is if your name repeats a letter too many times then your book will have repeats. The book sells for $34.95, with an extra $4.95 if you want to include a middle name. You can also include a gift box and bow for $5.95. Shipping is free on orders of $95 or more. Otherwise it is $9.95 for standard shipping. Besides the personalize content throughout the book, you can include a personalized inscription on the first page. The order form presents some canned text for you to include or you can write your own. It is a hard bound book so the $34.95 price isn't that unreasonable. When my six year old son open the book, his eyes just lit right up, and that was from just seeing his name with the book's dedication. As he turned the pages and realized what was going on, he was jumping for joy. To put it mildly, he loved it. And, at six, he was practically able to read the whole book himself. If you like personalized products for your kids or just need to pick up a unique gift for a friend's child (or a relative), this would make the perfect present. You just have to plan a little to give it time to print and ship. It isn't like these titles can be pre-printed for all the names in the world, with the custom dedications. Just give it about two weeks to arrive. If you're interested in winning one for yourself (or child), we'll be offering your version of the book as a prize in the upcoming Decked Out Dad's Day event later in the month. Be sure to check out that giveaway once it starts on the 22nd. There will be some cool prizes for all the daddies out there in addition to the book. Also, you can win a library of 10 personalize books, with 5 winners, right over from the publisher. Enter now. Sounds like a pretty amazing book to be able to see. I love when children's books are beautifully illustrated! I love these personalized books! My daughter gets so excited when she sees and hears her name inside. Great review! I love I See Me! These books are so cute and I love that they are personalized! My children love personalized books and I See Me does a fantastic job with them. This is a great idea. I had a family member gift this to her granddaughter. That is really special for kids to see interaction. I love this idea and it'd be perfect for my youngest. I will definitely be checking out the Decked out Dad's event to try and win later. Thx 4 shring! Wow, this does sound amazing and I'm surprised I haven't heard of them since they've been around for so long! I'll be back for the giveaway. My son has a birthday at the end of the summer, and good friends of ours have a daughter w/a birthday shortly after...this would be a nice gift idea for either child! So cool! Definitely a great gift idea to keep in mind. This would be great for me to give to my nephew. He is 2 1/2 but lives in Seattle while I live in Cincinnati. At such a young age he tends to forget the people that he does not see often. Incorporating the names of the people that love him from far away would be a way to keep us at the forefront of his memory. What a beautiful book! I love the personalization, too! My girls love when their names show up in books! What a great idea! My step-grandson just today had a new baby brother born, so we are looking for some "special" treats for him while the baby gets oodles of attention - this is perfect. This is awesome I am def going to look into this some more! I love the fact that you gave a personalized book to your wife as a gift 20 years ago. I bet she would love to get another one. I am going to tell my son about I See Me & perhaps he will give one to his bride for her birthday. I think being personalized will draw the kiddos into the story more. I think this is an awesome idea! Just had a little baby boy and this looks like an amazing idea to make your little one feel a little extra special! I have been wanting to get a personalized book for my nieces and nephews and love the selection I see me has! I love the idea of having a personalized book. The kids get such a thrill hearing/seeing their names and other personal things about them, in the books. Wonderful. I think what you do is inspipirational and amazing. I look forward to reading your books. The I See Me books are an awesome way to engage children into reading. The books are well written, colorful and well constructed. i've seen other personalized books, but never ones with such stunning artwork. wow!